Our personalised gifts make perfect birthday gifts. These aren’t just amusing and liked by children and parents alike, but also for very educational! Every birthday is a special mark in our lives. This is especially true for children! Every year they learn new and more complex things as well as progress into new interests and activities… We have unique personalised gifts that will not only make you and your children happy but are also very educational and helpful in many stages of their cognitive development. 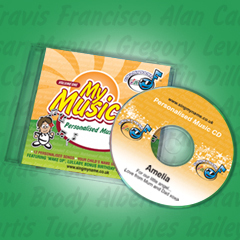 Our personalised CDs and Music Players are perfect gifts for very young children! 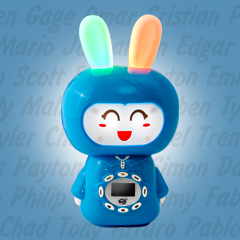 Our personalised Music Player sings 12 personalised songs, one of them the happy birthday song, it serves as a night lamp, it’s rechargeable, it has a microphone that allows you to record a message or your own stories and it can hold over a thousand of your own songs! This is also a great solution for a young child’s birthday present. These songs teach great values like being kind to animals, exercising and being happy at home or outside. They are also super educational with songs that teach them how to count to 10 and to learn and like their own name! fully functional Alarm Clocks that are completely silent during the night. (they don’t “tic”) The alarm sound in the morning sings a wonderful song featuring the child’s name. The lyrics of this “Wake Up” song tells kids to brush their teeth, wash their faces, dress up and numerous other healthy morning habits! 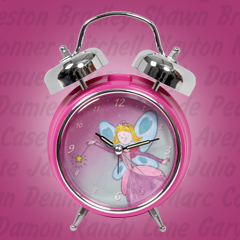 These personalised Alarm Clocks are wonderful tools to teach 4 to 6 year olds the time and help them start managing their own schedule, very valuable knowledge for their future!